(Reuters) -- A U.S. appeals court today upheld the dismissal of a lawsuit by the UAW claiming that General Motors was required to pay $450 million to cover medical benefits for an affiliate's retirees. A three-judge panel of the 6th U.S. Circuit Court of Appeals in Cincinnati said GM assumed the obligation for the payment two years prior to its 2009 bankruptcy, but a subsequent agreement with the union extinguished the company's responsibility. The payment had been part of a 2007 contract between the old GM, then-bankrupt supplier Delphi and the UAW. It was not, however, included in a different contract over medical benefits signed in 2009 by the reorganized "new" GM that emerged from Chapter 11 bankruptcy. Chapter 11 reorganizations can allow debtors to reject obligations that predate their bankruptcies. The UAW claimed the new GM owed the money by virtue of Delphi's own emergence from bankruptcy in October 2009. The 6th Circuit, affirming a lower court, said the language of the 2009 agreement made clear that GM did not owe the payment. 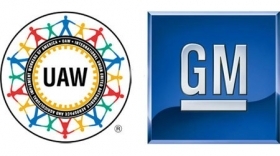 Under the agreement, "the UAW forever discharged GM from all obligations related to any claim arising in connection with...the GM bankruptcy proceedings concerning the provision of retiree medical benefits," Circuit Judge Danny Boggs wrote for the panel. A GM spokesman said the company was pleased with the decision. The union did not return a request for comment. About 50,800 current GM workers are represented by the UAW, a spokeswoman for the union said.